Cretan caves are really wonderous sites to visit. Some of them are composed of multiple chambers,situated at different levels and joined together by passages. 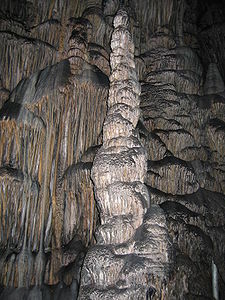 Many contain stalagmites and stalactites; some have pools of water. In such an atmosphere of partial or total darkness,it is easy to understand how human imagination could be spurred to see the shape of the rocks divinities or spirits. For these reasons caves became places of worship as early as the First Palace period. It was only during the New Palace era,however,that cult became really intensified,continuing not only after the palatial system but well into Greek and Roman times. The reason for this continuity must certainly be sought in the emotional response that the awsome atmosphere of caves evokes in the human psyche. Even in our times,there is a little chapel built over the cave of Skoteino east of Heraklion. The cave is still used for yearly celebrations. The interior of the caves were utilized.Natural rock formations,such as those in the first chamber of the caves at Skoteino and Amnissos,become focal points for worship. Flat rocks could be put to use as alters. Objects were sometimes placed in between rocks or stalagmites,but man made alters are also present. The offerings are typical of votive religion and do not differ significantly in character from those in peak sanctuaries. 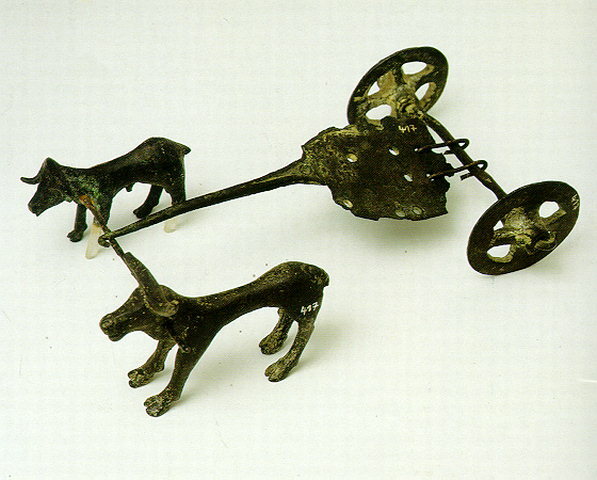 The main difference is the pre-ponderence of bronze over terracotta objects,especially figurines.This may have to do with the fact that caves were used for more specialized needs than peak sancturies.Some may have been for public festivals,others may have served personal needs,and yet others may have beeen used by special groups or societies.. Many caves had relatively poor votives: cups,jugs,kernoi,bowls,even pithoi.Others included more prestigious items, such as stone offering tables,bull rhta,seals, jewelry,double axes and weapons. This descrepancy in the wealth and the types of offerings between the two categories has led scholars to postulate different types of deities for each group. The variation seems to reflect a fundamental difference in the identity of the worshippers rather than the venerated gods. Whereas some caves would have been under the influence of the palatial theocracy,others could have attracted rural inhbitants for the performance of popular cults in the countryside. The cave of Kamares is situated within the domain of the palace of Phaistos,high up in the mountains; it flourished during the First Palace period. Because of the altitude,there is snow in the winter,which makes visits impossible during this time of year,only the late spring and summer could people climb there. A seasonal festivity seems a plausible occasion for the visits of the pilgrims. The finds support this theory because neither figurines of worshippers nor personal items were found,only pottery which consisted mostly of dining equipments,such as jars,jugs,bowls and plates. 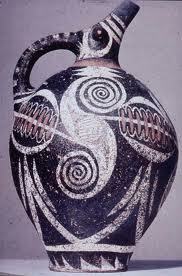 More of Kamares Ware My favourite Minoan pottery. In the interior there was found a heap of grain,and it is possible that more was kept in the storage jars of the cave. This would suggest that an agricultural festival was the occasion which prompted the visits to the cave,and that there was an ensuing communal feast.The participants would have been poor people from the countryside,but as the good quality of some of the pottery show (Protopalatial Kamares ware),palatial emissaries also must have taken part. 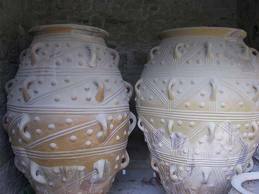 Storage jars were found also at other caves. Food storage presupposes collection and redistribution of produce. Storage Jars such as these would have been used to store grain. Bronze figurine found at Psychro. If we consider the idea that weapons suggest dedications by male warriors especially the cave of Arkalochori.There the votives consisted almost exclusively of weapons and emblems of power. 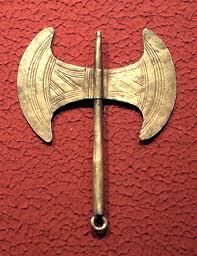 At least 100 double axes have been found, 26 in gold, 7 in silver,in addition to blades,swords and knives.Some of the double axes were inscribed,an indication of upper-class presence. It is easy to imagine that the Arkalochori cave would have been used by a society of warriors or priests whose insignia dignitatis were swords,daggers and double axes, dedicated during major festivals and/or initiation rituals. The deposition of ceremonial weapons,as well as the leftover raw material(which would be owned by the donor),would be an integral part of the ceremony. Other caves also yielded warrior figurines,especially the cave of Patso. Although these are Postpalatial in date they show continuity of the custom with later times.It is possible that we can link the custom of dedicating weapons in caves with the later Greek tradition of the mythical young Cretan warriors who brandished their shields in war dances. This line of investigation also leads us to initiation rituals and special societies. If there is some truth in this,a distinctive role for some of the caves emerges as centers of specialized social groups,especially warriors. This does not mean that we should exclude other participants. It is interesting that daggers are used as insignia of status in the iconography whereas weapons and religeous implements are combined in graves of personages of high status. Thus a society of warrior-priests can be easily imagined as fitting the context of the social tableau. As to the rituals,they must have been similar to those of peak sancturies. Here also we have evidence of libations and agricultural offerings,attested by jugs and stone offering tables. At Psychro,the latter were found around an alter together with chalices,jugs,cups and bowls.There were animal sacrifices and ensuing cult meals which left behind them bones and ashes..Some of the offerings,seals or figures,were destroyed by being thrown into the rock crevices or into a pool of water, as at Psychro. This recalls the custom of throwing objects into rock fissures or into the fire,observed at peak sanctuaries. A special instance of dedication consisted of embedding double axes and daggers in stalagtites. This act pre-supposes strength. The figurines exclusively represent worshippers,not deities. The gestures indicate reverence or, when the hands are streched out,offering. Given the fact that the figurines were predomenantly made of bronze,they would have been dedicated on special occasions or during major festivals. Life- crisis rituals spring to mind,but seasonal festivities cannot be excluded. The question of the deities venerated must be left open. 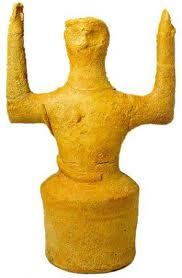 For only one cave, that of Amnissos near Knossos do we have information about the name of the deity worshipped. It has been identified as the cave of Eleithyia (the goddess of birth). 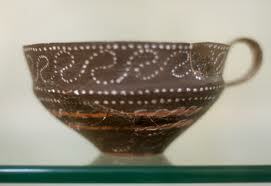 It yealded mostly pottery and hardly any figurines, and its floruit came in the Greco-Roman period. Despite so much information, many scholors suggested a chthonic goddess for some caves,or, in the case of Arkalochori, a war god. However we cannot speculate since the type of evidence of the ex-votus is not conclusive and can be analyzed from the point of view of the economic status and personal needs of the worshippers. Given the similarities of the objects at peak sancturies and caves,it is too simplistic to reconstruct celestial deities for mountain shrines and chthonic goddesses for caves. 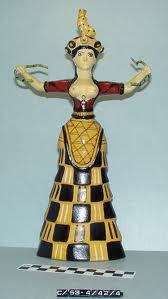 Nature santuaries have shown us a different facet of Minoan cult. It is in those places,those extra-urban sanctuaries,that official and popular religion met in common concerns,such as plentiful harvests or life-crisis rituals. That the places would try to use such cults to unite the population in the rural countryside is a logical assumption. The perception of the Minoans as peaceful people originated with Sir Arthur Evans He deduced this from their artistic creations which in contrast with gory and grisly themes in Near Eastern art,show so sensitive an appreciation of the beauties of nature that to associate their creators with strife and violence seemed impossible. In the past three decades papers by various authors.Alexiou(1979, 1981), Evely(1996, Driessen(1999), Norwicki(1999), Alusik(2006), have re-examined evidence for fortification, arms, armour and attitudes which contradicted Evans romantic view. The continuous existence of defence architecture from the final Neolithic throughout the Bronze Age was documentd by Alusik(2006).Logic tells us that there must have been a reason for the massive fortifications of Pre-and Proto-palatial sites. The increase in guardhouses in the Middle Minoanll period was interpreted as measures against internal enemies. Norwicki suggests that there were “zones of conflict and tension between Proto-palatial states”, Evely concluded that a thalassocracy could not have functioned without the implicit threat of warfare and that the Minoans quite probably were the premier arms producers of the Middle and start of the Late Bronze Age. Finally,reason tells us it is unlikely that the Minoans were an ecception to the rest of the human race and never participated in warfare or resorted to physical violence to settle differences. TRAUMA, SURGERY AND PRE-HISTORIC EVENTS. 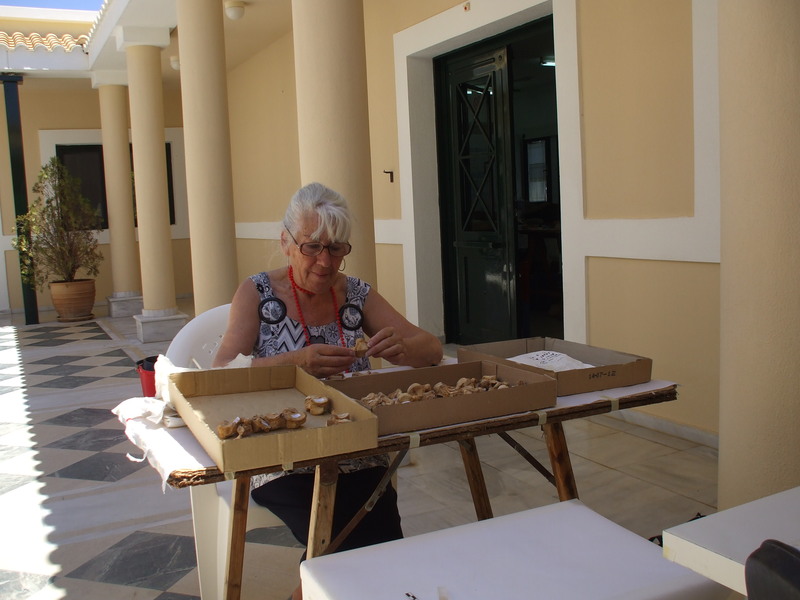 Tina McGeorge one of my colleagues at the Instap Study Centre has been working on the bones from the Hagios Charalambos cave burial in Crete. Here she shows us evidence from the anthropological remains excavated by Professors Davaras and Betancourt in the Hagios Charalambos cave ossuary, of discord amongst the inhabitants of the Lasithi Plain. There are a startling number of head injuries indicating occasional outbreaks of violence. The cave was used as an ossuary for the secondary burial of skeletal remains. The finds date from the Late Neolithic to the Late Minoan period.The number of burials (skulls excavated so far exceeds 400.) The excavators believe that the bones were transferred to this location on one or possibly two occasions separated by a short interval of time ,from tombs in the vicinity and placed in the cave in Middle Minoan ll period. Some stones intrusive to the contents of the cave betray their origin from built tombs. There are no discrete burials,so each bone is treated as a serparate individual. l l,000 have been identified so far. The material includes many healed fractures of arms,legs,collar bones etc; some of which may be accidental but some may be due to force. However there are l6 cases of cranial trauma,some of which are definately deliberate injuries. The majority of cases involve men(l l). The majority are on the frontal (l0/l5) or the left parietal(6 / l5), consistent with an instinctive rightward turn of the head to avoid a missile or to avoid a blow from a right-handed assailant. Three cases are trephinations; two more bear traces of what looks like scoring of the surgeon’s knife delineating the injured area. Case 8065: Is male, he has an incision cut mark over the midline of the forehead below the hairline,caused by the tip of a blade,which probably only perforated the external surface of the bone(PL.2.) 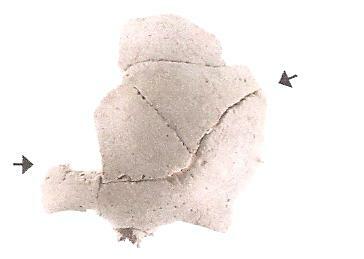 there is limited osteitos of the surrounding bone tissue and no reaction on the internal surface(so the patient did not die from this wound(the wound may have been caused by a knife,tip of dagger or sword,or even an arrowhead from a distance which caught him a glancing blow from his left side.Presumably he was not wearing protective/effective headgear. Case 8121 is a woman with a fractured frontal bone. The woman sustained a very forceful blow to the left side of the forehead above th orbit,inflicted perhaps with a wooden club causing distortion of the shape of the frontal bone and the bone to fracture adjacant(PL.4.) One can trace the course of the fracture line descending from the left coronal suture,horizontally above the left and right orbits terminating on the right side of the frontal bone. The jagged edges of the fracture had partially healed so she survived the attack at least for a short time. There is an area in the sinuses which is evidence of an infection,which may or may not be a result of the trauma. PL.4 Frontal bone fracture inflicted by a blow to left side of forehead. 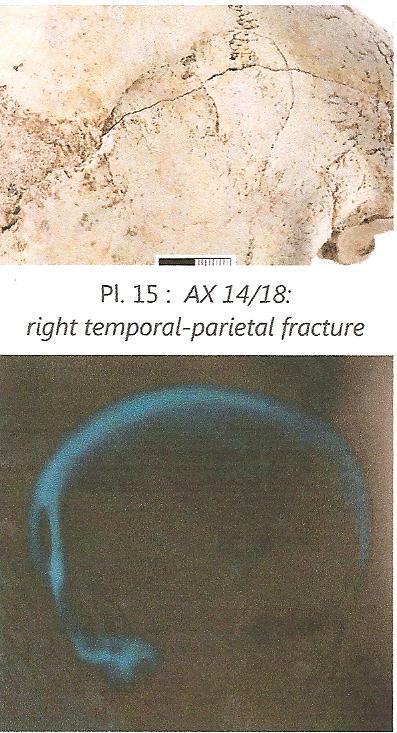 Case ax 14/18, is a middle aged male with a severe head wound: a healed right temporal-parietal fracture, caused by a severe trauma to the right side of the head,which displaced the bone inwards ( Pl.15). This would have caused pressure on the brain and possible spasms of limbs on the left side of the body. The displacement of the bone can be seen very clearly in the x-ray( Pl 16). Pl 16: AX 14/18 showing inward displacement of bone. In ancient times doctors did not of course have such means at their disposal but Hippocrates knew that such traumas to the area of the temporal bone cause spasms and advised against trephination in such cases.Indeed there is no evidence of attempted trephination on this specimen. The area of the wound appears to be encircled by a residual line scored by the sugeon’s knife ? perhaps when tending the wound. To sumerize there are a remarkable number of head injuries in this series(;15-16 so far ), proving that the Minoans were indeed capable of violent behaviour. We cannot know the precise nature or scale of the discord,if clashes took place on one or many occasions,if there were quarrels between individuals or larger scale regional conflicts,but we have incontestable evidence from these head injuries that violence did indeed take place. The casualties are mostly men, presumably not wearing adequate head protection.Women and children are under-represented. Most traumas are on the left side of the skull. Some of these traumas are certainly deliberate,not accidental. In the case of mutiple wounds there can be no doubt that the trauma is deliberate. 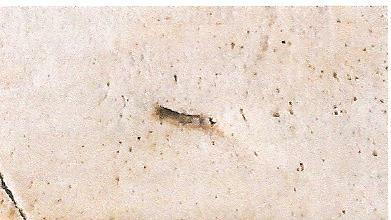 The lesions were caused by various weapons: a blade wound sustained perhaps in hand to hand combat.Another caused by a pointed object,sharp stone arrowhead or lancet. A fracture caused by a blow from a wooden club. Some circular depressions could have been caused by sling stones,highly effective missiles flung from a distance. The finds from Hagios Charalambos also have implications for the history of medicine and as far as Tina McGeorge is aware this is now the earliest evidence on Crete for the practice of trephining skulls.These cases are earlier than the example at Mycenae. The warrior from Grave D 51 reported by Angel( 1973: 380-81 is an amazing example of verbatim adherence to a proceedure handed down and recorded centuries later in the Hippocratic Corpus!. Following a head wound, trephination was performed on the left frontal and the flaps of bone left to exfoliate,unfortunately,the patient did not survive. But the patients from Lasithi did survive their operations,two of them for a considerable time,and judging from the beautiful healing of the bone,their operations seem to have been performed by highly skilled surgeons. So it appears that surgeons were already practising in the 18/19th century B.C. protocols that were transmitted to Hippocrates and written down in the treatises which date from the 5th and 4th centuries. Tina McGeorge working on bones from Hagios Charalambos Cave burial. Me sorting bones from the Hagios Charalambos Cave burial. The prehistoric surgeons at Lasithi knew that they had to avoid invasive surgery in the case of injuries to the temporal bone (eg. AX 14/18, which can cause spasms. They would have known that the brain floated in liquid and that it was important not to damage the meninges. Trephinations were probably more commonplace than we imagine as the physician/surgeon had none of the diognostic technology that we have today. He was obliged to investigate directly; delay could be fatal. Symptoms from head injuries could range from simple head-aches,blurred vision to paralysis of the limbs or the entire side of the body opposite to whichever brain-hemisphere sustained the pressure of a sub-dural haematoma caused by the injury, which it was imperative to relieve by trephination. So we can conclude from this new evidence that many generations of practice and accumulated observation preceeded Hippocrates’ description of these surgical procedures. How did this expertise come to exist in Lasithi? Perhaps war was the catalyst,as has often been observed,for aquisition, development and dissemination of surgical techniques and knowledge. What could have been the cause of the conflict or reason for the presence of hostile intruders? 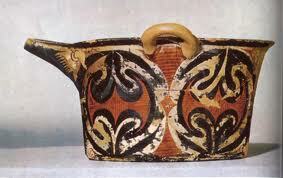 The pottery analysis has recognised changing patterns of regional “orientation” or loyalties. Prior to Early Minoan lll the pottery was mainly Messara orientated; in Early Minoan lll- Middle Minoan la loyalties switched to East Crete, though seals continued to come from the Messera; from MMlb-MMll there is an orientation to Malia and at the end of MM llb-MM lll there are Knossian incursions. Why? Nowicki has suggested that Lasithi was in important source of wood, but it may also have had other desirable commodities such as (food products,livestock), to give in exchange for those luxury items,which Susan Ferrence(2006) presented in her paper. The evidence of violence may reflect a local resistance to outside interference and coercion, though due to the nature of secondary burials these casualties of violence cannot be related to specific chronological horizons. The skeletal evidence for violence in Lasithi destroys the myth of the “peaceful” Minoans and reinforces hypothesis of tensions and territorial conflicts. Details are below for anyone wishing to study this subject further.